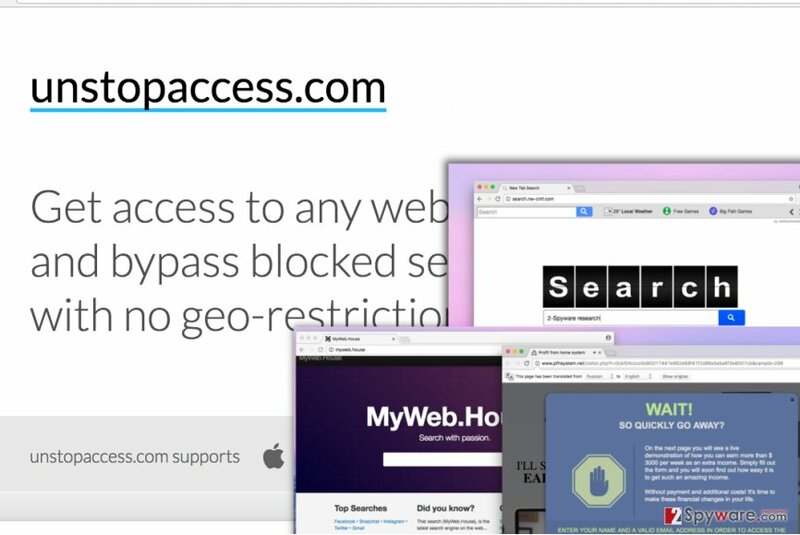 Unstopaccess.com is the PUP that uses misleading techniques to prevent removal. Use Reimage to locate malicious components and get rid of them faster than with uninstall instructions. A full system scan blocks virus reappearance and prevents traffic to malicious domains. Unstopaccess.com virus is a computer infection that controls web browsers and causes redirects to suspicious websites at random times. It is also known as AutoConfigurl virus, which modifies browser’s settings to employ WPAD.dat file as the Automatic Configuration Script in computer’s Internet Options. As soon as the browser gets affected, all of the browsers installed on the target computer system will use instructions downloaded from a remote location to change important browser’s settings. Usually, LAN settings are targeted. The script is controlled by developers of adware, therefore affected browsers might begin to cause redirects and display pop-up ads at random times, which apparently makes the computer user annoyed. As a result, your browser’s homepage might be changed without your knowledge(to secure-surf.net or others), your default search settings can be modified, and Unstopaccess.com ads will follow no matter what website you will try to visit. There’s no need to mention what other problems might arise as a consequence of this virus’ activity. Redirects to dangerous websites can increase chances of installing malicious software, so we suggest you stay attentive and cautious. Ideally, scan the system with anti-malware software to exterminate all files associated with this bothersome computer infection. You can also try to delete the virus using instructions provided at the end of this article. Unstopaccess.com redirect virus is just one of many identical ad-supported browser hijackers such as No-stops.net, Stop-block.org, Nonestops.biz and many others. All of them have identical-looking official websites that describe these programs as tools that allow users to “get access to any website and bypass blocked services with no geo-restrictions.” In reality, these websites function as a smokescreen to conceal the true purpose of these potentially unwanted programs. We must warn you that usually, victims find it hard to remove Unstopaccess, so we want to provide an alternative removal option for those who are not willing to waste time trying to find all components of this virtual parasite. You can clean the system and fix your browsers by running a full system scan with Reimage software, or, if you prefer, Malwarebytes MalwarebytesCombo Cleaner software. Unstopaccess.com virus usually changes browser's settings without user's permission. Computer users usually do not realize that a Proxy URL virus has sneaked into their systems until they discover that annoying browser redirects and ads cannot be stopped by simply uninstalling suspicious programs and browser add-ons. It is so because these computer parasites are far more advanced and consequently it is harder to remove them. They do not usually leave files on the system, but they modify Registry entries and also browser settings. However, you can get infected with such programs after carelessly installing a different program such as game, video player, or file converter. When installing free programs, be attentive to details such as what installation settings are suggested for you. Do NOT let the installer use Default or Standard settings because they are usually the ones filled with permissions to install extra and unnecessary programs such as Unstopaccess redirect virus that later turn out to be adware or browser hijackers. Refuse to install them by choosing Custom or Advanced settings and deselect all extra programs presented to you. Users can remove Unstopaccess.com virus in two different ways. The infection can be eliminated either with or without anti-malware software, although we highly recommend using it. It simply makes the task easier and saves your time; however, if you are willing to try your best and delete this threat manually, please study this Unstopaccess.com removal tutorial we provide. The removal process requires configuration of Windows Registry, and if you accidentally do something wrong while in this panel, other programs might start to malfunction. First of all, reboot your computer into Safe Mode. To do this, press down Windows Key + R and type msconfig into the Run window that appears. Click OK.
Now, System Configuration window should appear. Go to Boot tab and under Boot Options select Safe boot. Click Apply and OK. Once your computer boots into Safe Mode, continue. Repeat Step 1 but instead of msconfig, type regedit. In Windows Registry, expand HKEY_CURRENT_USER folder, then SOFTWARE, then Microsoft > Windows > Current version > Internet Settings. In this folder, you should find AutoConfigUrl Key. Right-click on it and select Delete. Click OK to finish. Now repeat 1-2 steps, but deselect the Safe boot option and then reboot your PC back into normal mode. Here, look for Unstopaccess.com or any other recently installed suspicious programs. Wait until you see Applications folder and look for Unstopaccess.com or any other suspicious programs on it. Now right click on every of such entries and select Move to Trash. Go to Internet Options > Connections > LAN settings. Here, uncheck Use automatic configuration script option. Delete the unstopaccess URL from the Address bar. Hit OK to save. Reset IE. When in the new window, check Delete personal settings and select Reset again to complete Unstopaccess.com removal. Once these steps are finished, Unstopaccess.com should be removed from your Microsoft Edge browser. Open Mozilla’s menu, go to Options > Advanced, then to Network tab > Settings. Remove check mark near Automatic proxy configuration URL. Refresh Firefox via about:support page. Here, select Unstopaccess.com and other questionable plugins. Click Remove to delete these entries. Now you will see Reset Firefox to its default state message with Reset Firefox button. Click this button for several times and complete Unstopaccess.com removal. Here, select Unstopaccess.com and other malicious plugins and select trash icon to delete these entries. Click Reset to confirm this action and complete Unstopaccess.com removal. Here, select Extensions and look for Unstopaccess.com or other suspicious entries. Click on the Uninstall button to get rid each of them. Now you will see a detailed dialog window filled with reset options. All of those options are usually checked, but you can specify which of them you want to reset. Click the Reset button to complete Unstopaccess.com removal process. ^ Browser redirect virus. How to Remove? (Uninstall Guide). 2-Spyware. Fighting Against Spyware. ^ Using Automatic Configuration, Automatic Proxy, and Automatic Detection. Microsoft TechNet. Browser TechCenter. ^ Malware: Viruses, Spyware, Adware & Other Malicious Software. UMass Amherst Information Technology. Security Center. ^ Top 10 Ways PUPs Sneak Onto Your Computer. And How To Avoid Them.. Emsisoft Blog. Information about Cyber Security. This entry was posted on 2017-05-04 at 07:13 and is filed under Adware, Viruses. You can quickly scan the QR code with your mobile device and have Unstopaccess.com manual removal instructions right in your pocket. How did you remove Unstopaccess.com?